While I was in Nepal, I spent time working with my good friend Sudip Aryal. 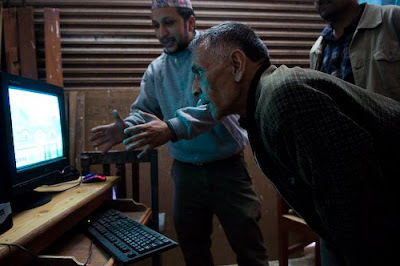 Sudip started a organization called NRIDS (Nepal Rural Information-technology Development Society) to increase access to technology in his home district of Syangja. Sudip and I spent a lot of time planning a rural wireless network to beam internet from the tourist hotspot of Pokhara over a nearby mountaintop, and down to five villages in Syangja district. The entire project could be done with the same hardware you use to get wifi access in your local coffeeshop. NRIDS has a network plan, it also has technical volunteers willing to work for free. Now all it needs is money to buy the hardware: USD $8000 to be exact. Check out the fundraising piece I did for NRIDS, and if you feel like it...give a few bucks by PayPal. Every bit helps! may your genuine ideas navigate NRIDS to transform communites to optimum thrive.